The British Gazette » Brexit: When poverty comes in the door, love flies out the window! 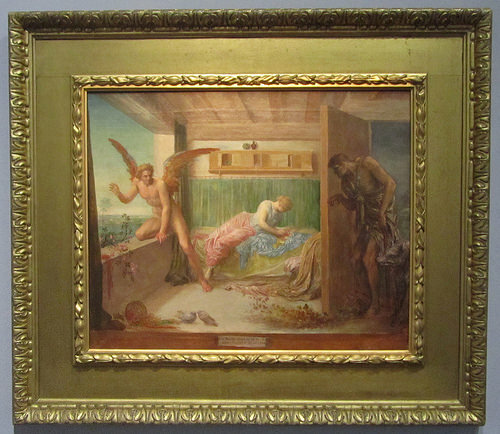 Above, George Frederick Watts’s 1892 painting entitled, “When poverty comes in the door, love flies out the window” – which was of course one of quotes of playwright Oscar Wilde. If the deluded fools that appear to constitute a significant part of today’s Tory party think that a “No Deal” Brexit is somehow politically survivable for them and their party, they really need to read learn and inwardly digest the “hard tack” and “thin gruel” that Doctor Richard North serves up today! We appear to have reached the stage where the political and journalistic establishment have locked themselves into acting out a narrative they cannot and will not deviate from which will lead to disaster for them, their constituents and readers. Of course, of the three, the journalists will be like the seagulls who will be able to fly up escaping the fray whilst continuing the report the carnage below them. What our politicians have to realise is that the generation that experienced “the Blitz” of 1940 and had the “Dunkirk spirit” are for the most part dead! The new generation of Britons are VERY different. For a start, in 1940 we had a relatively homogeneous white Christian population. This is NOT the case in our cities today! These people do not and will not react like the population the UK had in the 1940s and the 1950s. Things will be different! Furthermore, whilst it is possible to invoke a “Dunkirk spirit” in the face of a natural disaster; this is NOT the case when the disaster is entirely man made and could have easily been averted/avoided. Let us re-emphasise: Things are going to get very very bad after 11:00PM on Friday 29th March 2019! Now, whilst there have been very many changes in the UK in the 80 years since 1938, there are many things that remain the same or similar. One of them is the relative ability to avoid the consequences of one’s actions! There has always since throughout history been a positive co-relation between authority/social-class/wealth and the physical consequences/deprivation/hardships endured. This of course was most brutally demonstrated on the Western Front during WW1 when the generals were ensconced in luxury in French châteaux whilst the working class soldiers that constituted the bulk of the “poor bloody infantry” were blasted to pieces! As it was in the allied summer offensive of 1918 so it will be in the bloody spring of 2019. Whilst Madame Mayhem will have her special branch protection and due to her wealth be able to move into safe and secure surroundings, the “poor bloody infantry” which are the ordinary Tory party activists will NOT escape the retribution and retaliation of the mob. Those activists who are known in their communities are likely to find themselves the subject of harassment. At a low level this may well take the form of the sides of their cars been “keyed”. More serious would be dog faeces being pushed through letterboxes. This would also constitute verbal abuse in places such as supermarkets, which if responded to may well lead to physical assault. This of course also applies to UKIP members. It also applies to the Editor of this blog! Notwithstanding the FACT that I have consistently endorsed Doctor Richard North’s “take” on Brexit from the start of the 2016 EU Referendum campaign and have advocated EEA+EFTA for the UK, this will not prevent the mob who only know me as UKIP from targeting me. That FACT of the matter is this: Something must be done! To get MPs to realise that they have to change course before it is too late! The UK cannot afford a “No Deal Brexit”!